Undoubtedly the first influence on Picasso's art was the work of his father, Jose Ruiz Blasco, a painter and and teacher who nurtured his son's talents from on early age. However, by his early teens Picasso was already rejecting this academic style and was experimenting with styles derived from contemporary avant-garde practitioners. Picasso's first successful works were a series of drawings and pastels representing the bohemian circle of friends he had joined as a young man in Barcelona. In 1900, these drawings formed the core of his first major exhibition in the city. 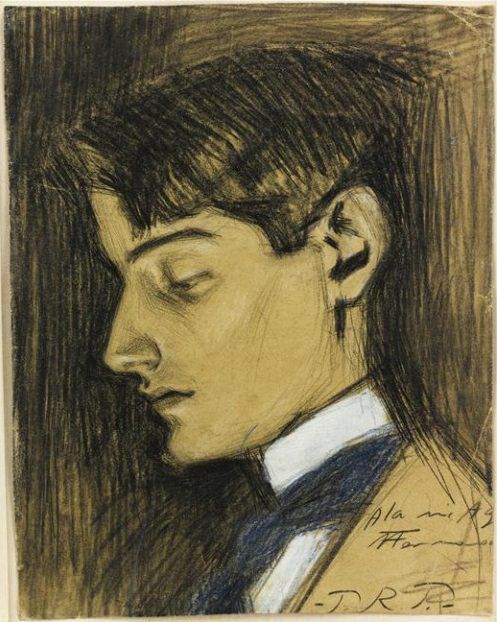 Picasso's major influences of this time were an older Spanish artist, Diego Velazquez, and the Spanish Old Masters El Greco and Francisco Goya, whose works he had seen in the Prado, He was also aware of the work of Henri de Toulouse-Lautrec (1864-1901), whose influence can be detected in this portrait of Picasso's close friend Angel Fernandez de Soto, Here the swiftly executed pastel marks and the mood of melancholic contemplation recall Toulouse-Lautrec's many pastel sketches of the late-nineteenth century.